How Many Calories Are in a Sharon Fruit? Mangos originated in northeast India but later spread to other parts of Asia, Africa and South America. 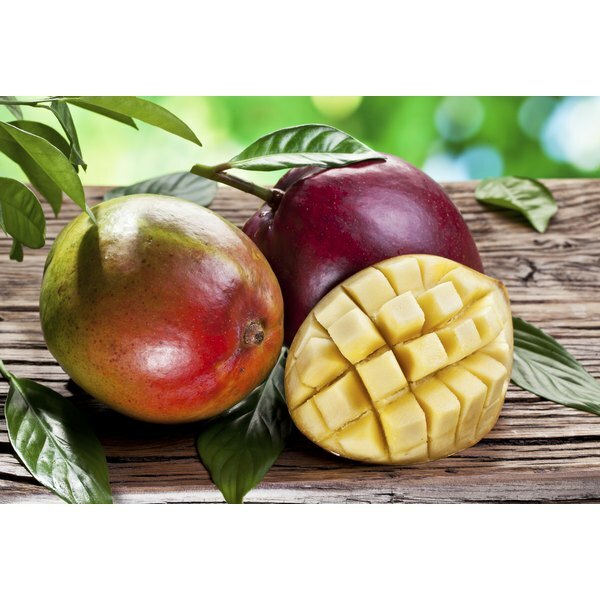 Selective breeding and careful domestication has altered the original mango, which was probably small, fibrous and difficult to eat, into the large, sweet fruit that is now commercially available. The wide distribution of the mango has led to the development of many various cooking methods and uses. Tropical cuisines feature baked mango as a dessert. An entire ripe mango contains only 107 calories. Remove the skin from the mango and slice it in half. Extract the seed, or pit. Place the mango, hollow side up, in a baking dish. Drizzle the mango halves lightly with lime juice and honey. Bake the mango for 5 to 10 minutes, or until the mango is lightly caramelized. Transfer the mango onto a serving plate and serve while it's still warm. Additional flavorings can include vanilla beans or extract, cinnamon, sugar, butter or even wine. You can top the baked mango with low-fat whipped cream or ice cream for a satisfying rich dessert that's not high in calories.